This is the final in a series about the #FutureOfBusiness that highlights the impending shift in organizational change. In my first post, Will The #FutureOfBusiness Radically Change Everything As We Know It? I highlighted the economic and market shifts that have forced business to finally take notice: including a volatile world economy, impending impacts on budgets, continuous tech innovation driving consumer consumption and communication – all driving significant operational and mindset changes at the corporate level. The second in the series, The #FutureOfBusiness Is Social: Adapt Or Die referenced a C-suite organization unwilling to embrace, let alone acknowledge, impacts of these changes because of sheer ignorance (for one), but also because of the upheaval and organizational risk that they impose. Senior management is unwilling to relent to the strength and power of the consumer. It’s surprising how many businesses still “think” they can control the message, despite the countless examples of organizations that have been humbled by this thing called social media. By preserving control at the top of the hierarchy, these same organizations are increasingly vulnerable to the volatility of the customer voice. The conclusion: the organization needs to change to a more human one, not to only respond to the external market and consumer changes, but also because of internal pressures. No longer will current organizational structures and processes survive in the current environment. The latest jobs report showed the unemployment rate was at its lowest level in six years, 5.8 percent. But Americans aren’t convinced that things are nearly that good. In a recent Ipsos-MORI poll, 1,001 Americans were asked, “Out of every 100 people of working age, how many do you think are unemployed and looking for work?” Their average response was 32. That’s almost 26 percentage points higher than the 6.1-percent jobless rate in August, when the poll was conducted. But the U.S. isn’t alone. The same holds true for many Western countries. When asked the same question, respondents from countries representing Poland, Belgium, France, Canada, Australia, etc. response was on average 20 percentage points higher than the actual jobless rate. At the same time, there is no good news about economic recovery. This isn’t the first time I’ve heard pundits warning of another impending global recession in 2015. It’s a wonder why consumers are ever so wary these days. These same consumers are also employees or entrepreneurs. They’ve witnessed, first hand, its effects on their livelihoods. They, along with the current workforce, have come to a cruel realization that times have changed. The dizzying destruction of business, especially among those that were seemingly indestructible, has given rise to a climate of mistrust and self-preservation. People don’t expect to be working their entire lives for the same company. Organizations are now short-term focused on performance, therefore this leaves employees much more vulnerable to downsizing as the need arises. Employees, angered and frustrated at company decisions have made, have felt powerless. Now employees who cannot impact changes internally can take their messages to their social networks and allow the media and world, at large, to be judge, jury and executioner. Government is now developing more small business programs to encourage American job seekers to choose an alternative career path; 27% of Millennials are already entrepreneurs. Mikal Belicove, Entrepreneur Magazine Columnist, author and business writer recently delivered a lecture at Keystone College entitled, “10 Rules for Entrepreneurship You Never Learned But need to Know”. This current state has reduced the organizational leverage significantly. 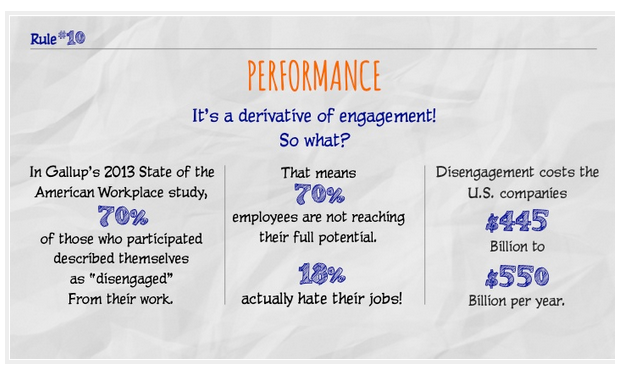 Employees who are disengaged in their current jobs will seek satisfaction elsewhere. Millennials to whom we’ve spoken are far more interested in getting experience from diverse projects and companies and are more than willing to leave a job to obtain this. A company, by today’s standards, can no longer keep the best and the brightest. The rise of the freelance economy also provides amazing opportunities for companies to continue to get the best quality work despite this new lack of loyalty. The “evolved” CEO realizes that while their company is vulnerable to market shifts, survival also depends on leveraging the strength and advocacy of employees. In order to adapt to an increasingly consumer-controlled marketplace, an organization will need to rely on its workforce to scale responses, adapt products and services, and defend the organization when needed. that has an ongoing capacity to generate and produce and create. Being generative is ultimately a sustainability capacity, not a one-off event. It is perpetual. This once hierarchical structure will collapse. In order for the organization to truly embrace “inclusion” it must seek to flatten its structure and allow decision-making and innovation to come from all levels of the organization. This sends out a strong signal of trust to the rest of the organization. Not only will this increase accountability at the individual level, there will be a renewed sense of purpose and engagement that perhaps increases loyalty as well. Many companies are realizing that mandated 9-5 workday is unrealistic. Coupled with an increasing remote-access workforce, companies must now acquiesce to developing a level of trust among its employees with this increased flexibility. 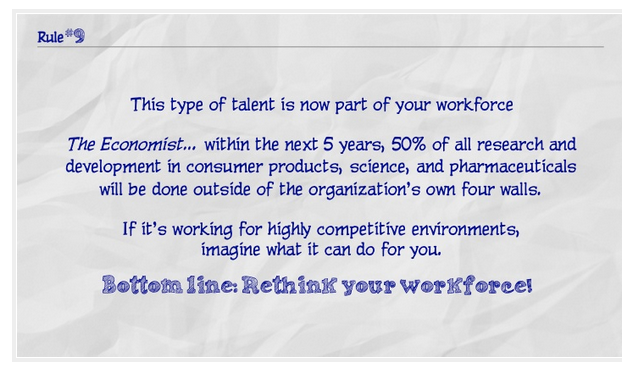 However, a remote workforce also allows companies to hire the best and the brightest. No longer is there an expectation or desire for prospective employees to reside in the same location as the employer for whom they work. Fostering a culture of trust and inclusion that seeks to break down silos enables a less inhibited environment. What results is the development of a collaborative culture that allows information to come from everywhere in the organization and embraces solutions from anyone. This process will take time to develop so that it becomes a natural part of culture; technology will also enable this. However, once it begins, the organic result allows a synergy that will be felt across the organization, by way of productivity, improved employee satisfaction, a renewed workforce and ultimately a responsive and profitable organization.